Novel graphical concept. Creates unpredictable effects. Perfect for glitch-orientated music. Tried and tested Audio Damage quality. Extremely tricky to master. Not the most versatile plug-in. Automaton is an 'effects sequencer' plug-in, with four different processors in series. However, the interesting thing about it is its triggering mechanism, which is an adapted version of the classic mathematical construction known as a 'cellular automaton'. Cellular automata are based around a grid, and, in Automaton, each cell in the grid can be in one of two states: dead or alive (lit or unlit). With each 'turn', the new state of every cell is calculated in accordance with a set of rules, which are typically related to the configuration of a cell's adjacent neighbours. In Automaton, each step occurs in sync with the tempo. The most famous cellular automaton is without doubt John Conway's The Game of Life, and its rules are represented here. Others include Gnarl, Replicator and Serviettes, but there's a dead simple Sequencer one too, which makes the grid behave much like a typical step sequencer. You can draw in the initial state of the grid, and either let the pattern endlessly mutate, or use the Sequence Reset parameter to recall the original pattern (or a random one) at certain intervals, bringing a little order to proceedings. 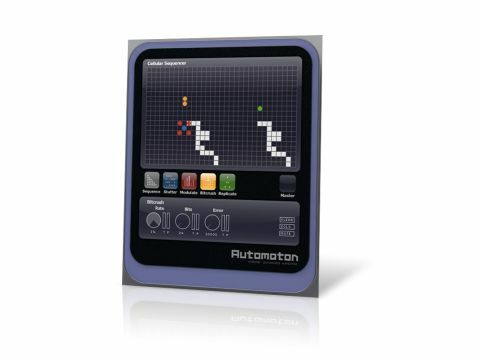 Automaton enables the user to insert trigger points into the grid. When the ever-growing pattern (shown in white) overlaps the user-defined points (blue, green, red and orange), the assigned effect is activated. As for the effects themselves, we'd have to say they're every bit as good as Audio Damage's other efforts. Stutter repeats small sections of audio, creating buzzing and bleeping noises; Modulate is a ring modulator; Bitcrush is aptly named; and Replicate is a slightly watered-down version of Audio Damage's Replicant. Each effect has its own sets of parameters, and certain control knobs also have two additional sliders labelled ? and P. The first of these offers additional random modulation of the adjacent knob, while P (Population) offers modulation according to the number of active triggers for that processor. For example, if the mutating white cells are currently covering several of the orange BitCrush trigger cells, the number of covered cells has an influence on any parameters in the BitCrush processor with their P slider turned up. Automaton's main drawback is that for all its genius and innovation, it is a pretty unruly beast. Audio Damage has a reputation for occasionally producing plug-ins that are tricky to master (Replicant and Dr Device spring to mind), but we reckon Automaton takes first prize. Even after days of solid experimentation, we found it quite tricky to use in real-world projects. For example, what sounds good on one sample rarely works on anything else, as opposed to Replicant, where a bit of tweaking is usually all that's needed. Automaton is instead best used as a source of inspiration or as the basis for a fresh composition. Our other concern is that it does just one thing, albeit very well: it creates glitchy versions of whatever you put into it. With this in mind, we have to mark Automaton down a bit. However, if you make any style of music that utilises glitches and esoteric bleeps, then it's yet another must-buy from Audio Damage.